Who’s tried goat’s cheese chocolate truffles before? If you haven’t you’re in for a surprising treat. They make a fitting end to a dinner party meal and will be much appreciated by any self respecting chocolate and cheese lover on any occasion. Way way back many months ago, I was unable to attend a blogger’s event at Chantal Coady’s Rococo chocolate factory. I read many accounts of the fabulous time had by all. The highlight for most, other than indulging themselves with chocolate, was a demonstration of how to make goat’s cheese truffles. I’d already heard accounts of how well these two unlikely ingredients worked together and indeed I’ve tried the combination out for myself on several occasions. My goat’s cheese and chocolate tarts are so good, I keep coming back to them again and again. I didn’t, however, get around to trying out goat’s cheese chocolate truffles until I hosted a six course chocolate dinner back in July, when I thought they would make a fitting and interesting end to the meal. Annoyingly, I didn’t have a recipe and after looking on the internet and getting baffled by all the myriad permutations I found there, I just made up my own very simple version. Goodness gracious me! These goat’s cheese chocolate truffles were as delicious as I’d hoped. They finished the meal off very nicely indeed. I decided to use a sweet milk chocolate rather than a bitter dark one as I thought it might combine better with the saltiness and the goaty tang. Even with the milk chocolate and addition of sugar, these were almost, but not quite savoury. They made a fine stand-in for the traditional cheese and fruit course. These goat’s cheese chocolate truffles would make excellent Christmas gifts for the more adventurous chocolate or cheese lover. Indeed, if I get my act together I’ll be making another batch in time for the festivities. They’d also be perfect served up on Valentine’s Day or as a nice birthday gift for a chocolate and cheese lover like me – just saying! This month’s Tea Time Treats is for Festive Foodie Gifts, so I am sending some of these goat’s cheese chocolate truffles to join the prettily packaged tea time table over at What Kate Baked. I expect Karen of Lavender and Lovage will be taking a look-in too. These truffles weren’t exactly small, but they are in individual portions, which makes them eligible for Treat Petite with Cakeyboi and The Baking Explorer. The theme this month is Happy Holidays. Recipe of the Week with Emily over at A Mummy Too also gets to enjoy one or two of these fabulous truffles. Thanks for visiting Tin and Thyme. 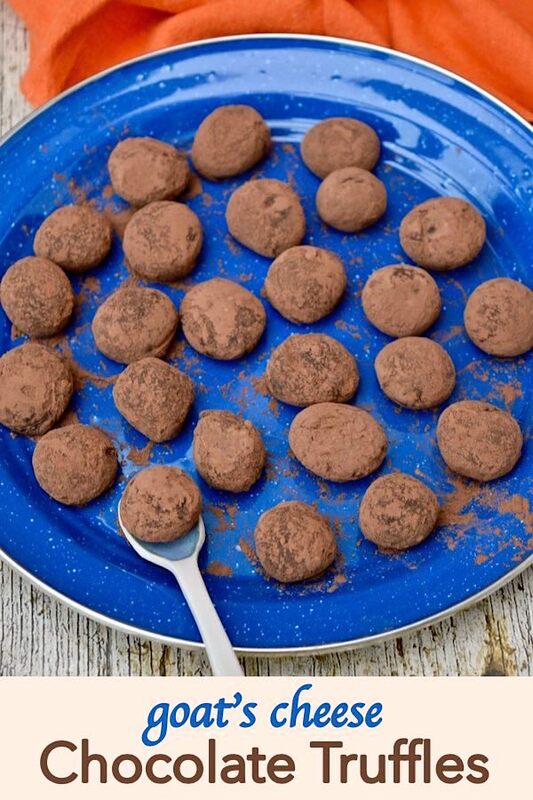 If you make these goat’s cheese chocolate truffles, I’d love to hear what you think about them in the comments below or via social media. Do share photos on your preferred social media site and use the hashtag #tinandthyme, so I can spot them. For more delicious and nutritious recipes, follow me on Twitter, Facebook, Instagram or Pinterest. Goat’s Cheese Chocolate Truffles. PIN IT. Sweet and salty rich chocolate truffles which only have a slight flavour of goat. Surprise your friends with these easy and delicious treats. Melt the chocolate in a bowl over a pan of hot, but not boiling, water. Then leave to cool a little. Beat the cheese with the sugar. Stir in the chocolate until all incorporated. Place in the fridge to set for a couple of hours. Sift 1 tbsp cocoa powder into a bowl. Roll teaspoonfuls of the ganache into balls using your hands, then drop them into the cocoa. Roll them around until fully coated. Place back in the fridge until ready to eat. I made 30 truffles, but the number will depend on how big or small you make them. Now I could so totally eat these!!! Chocolate and goat cheese go so well together!!! I would love to try this combination of flavours, as I love both goat’s cheese and chocolate. Brilliant idea! I’ve seen this combination but am nervous about trying it – I suppose you have to pick a relatively mild goats cheese? Love to give these a try. How come didn’t I think of using goat cheese in chocolate truffles!! They look exquisite! Hey this is really new! Great idea to use goats cheese. A fab match with chocolate. Your truffles look simply divine!!! If you haven’t experienced good truffles, the best I can do is to describe them this way: Truffles act on the brain. Their taste and aroma nearly overwhelm the senses, flirting with mental associations of over-indulgence and decadence, even naughtiness. Eating them at a restaurant, you might feel like you’re doing something that shouldn’t be done in public. This, of course, is part of their charm, and goes a long way to explain their cachet and expense. What an interesting combination! If only the internet allowed us to taste what we read… Thank you very much for entering TTT and Happy Christmas!